We do not charge a flat fee for editing a paper but customize our pricing to fit each specific paper. Therefore, you must send us your complete paper so that the editor can do a diagnostic edit (the sample edit) to determine the cost of editing your paper and look over the whole paper. We usually charge by the word, which is based on an hourly rate of $50 ($60 to $75 for heavier edits or more senior editors, and $150 per hour for specialized editors). After we’ve calculated the per-word rate, we multiply that per-word rate, for example, 3.5 cents, times the number of words in the manuscript. This per-word rate gives you a firm quote going into the job, which can give you peace of mind: You pay for the exact number of words that we edit. We are also happy to charge by the hour, which can be more economical in some situations. For the editing of application materials (grant proposals, CVs, cover letters, teaching philosophy statements, and research statements) our per-word rates range from 6 cents to 25 cents for our top application materials editor. For proofreading, which is the final step in the process, after all editing and copyediting have been done, we charge between 2.5 cents and 3 cents per word. For a paper we’ve just edited, that is, the second editing pass with the same editor who just edited your paper, the proofreading rate is 10 percent lower than your hourly rate. Please note that while many clients refer to copyediting and editing as proofreading, in editor parlance, proofreading is not equivalent to copyediting or editing. Several factors affect the cost of editing your paper. In addition to the number of words, we look at the extent of editing required, quantifying the edits based on the amount of grammatical or wording problems in the lines. We also take into account the extent of “structural” editing, that is the analysis and solutions the editor provides in the comments on the logic, flow, or overall organization of the paper as well as any actual restructuring, which can involve moving sentences or providing recrafting of sentences (which your editor would ask you to review to ensure that the sense is in tact). All changes are tracked (in a different font color) so that you can readily find them. We find that Microsoft Word offers the best vehicle for tracking changes and commenting. Cutting text, which we are often asked to do, is more costly because the editor has to make difficult decisions about what to cut. If it’s very repetitive or goes off on tangents, it’s easier to cut. But we cannot always guarantee to cut as much as is necessary, especially by condensing. Typically, a light edit is limited to edits on the word and sentence level and would not require substantive rewriting. A medium edit can include more structural issues on the sentence and paragraph level. A heavy edit can include all of the above plus structural issues on the document level, such as the reordering of paragraphs or cutting of redundant text, which calls for a more nuanced and in-depth understanding of the text. When you submit your request for a sample edit and price quote, we ask that you submit the full manuscript. With the full manuscript your editor can review the paper for any structural problems that could impact your cost, and the ultimate success of your paper. Knowing the full size of the paper also helps us to identify an editor who can complete your job within your requested time frame. The editor who will edit your paper will provide you with a sample edit (for a manuscript longer than 5,000 words, 500 words; for a manuscript less than 5,000 words, 10 percent of the full text), which we use as the basis of your quote. With this sample edit, you can see what sort of edit the editor will provide. Your cost is commensurate with the level of edit demonstrated. Within 48 hours of receiving your complete text, we will return our no-obligation sample edit and price quote for editing the rest of the document. The sample edit demonstrates what you can expect for the full edit and also helps us to verify the appropriate level of edit for your paper. We do reserve the right to refuse to do a sample edit if we do not think we can edit your full paper. If we format only — without editing — we charge between $40 and $45 per hour. We can also provide you with a fixed quote for formatting jobs. We can check the accuracy of your citations. For this work, which can be very time consuming, we charge $45/hour. As a small firm, we are able to meet a broad range of customer needs. So if you have any specific requirements, please inquire. We accept small jobs but have a minimum order fee of $50 for papers that are 1,000 words or less. Oxford Editing makes an effort to be competitive in our pricing. Because we are a small firm, we are able to work with clients to offer them the best value. Therefore, we are willing to consider matching or beating a competitor’s price. Please inquire. 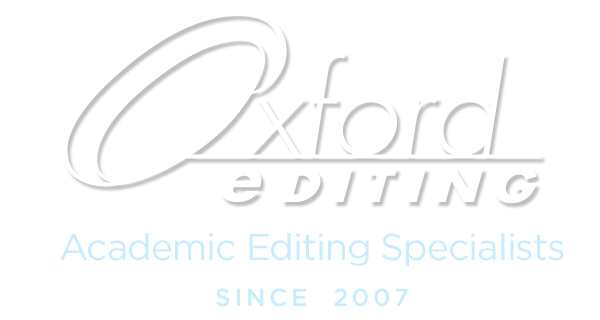 Oxford Editing accepts payment via Visa, MasterCard, Dwolla, and PayPal and wire transfers. For clients with a US bank account we can offer bank-to-bank transfers, referred to as mobile or email transfers, with some banks. Please let us know in advance if you would like to pay with a wire transfer. Dwolla is our preferred payment method. To pay for your editing job using a credit card or using Dwolla to pay directly from your bank account, please go to the Oxford Editing Payment page. 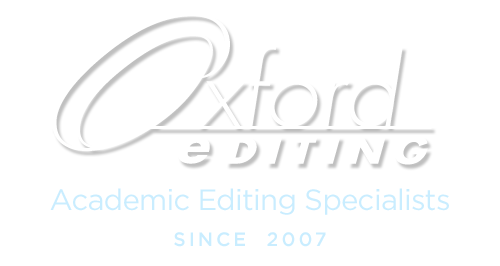 Oxford Editing’s editing services can help you produce a text that is lean, clear, and highly readable both to native English speakers and to non-native English speakers. Using our services can shorten your production time. That is, if you need a fresh pair of eyes to look objectively at your writing but don’t have the time to gain that objectivity through the distance of time, we can speed up the manuscript production process for you by offering the objective assessment that every document headed to publication needs. Our editors understand publishing standards, journal and book publishers’ expectations, and how to craft a winning text. Please read our Testimonials to appreciate the value of choosing our academic editing services.